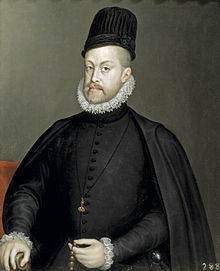 Philip II (Spaingie: Felipe II; 21 Mey 1527 – 13 September 1598) wis Keeng o Spain frae 1556 an o Portugal frae 1581 (as Philip I, Filipe I). ↑ Spain wis a composite monarchy, an besides bein the seicont Philip tae rule Castille, he wis the first tae rule Aragon an the fowerth tae rule Navarre. This page wis last eeditit on 10 Februar 2019, at 14:56.